Foodshelf reinterprets the design of the contemporary kitchen. 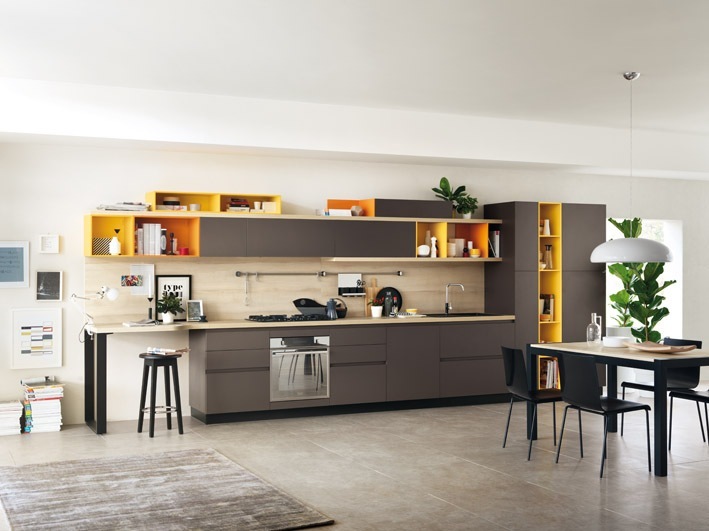 The designer – in his first approach to the field of kitchen components – has rethought, through his personal touch, the world of values of Scavolini (www.scavolini.com) in a variegated and versatile project. Easy to personalize, Foodshelf gets its inspiration for a new take on the relationship between the kitchen and the living area. Its specificity lies in reinterpretation of functional factors in living space, which in Ora-ïto’s concept are transferred and extended to the kitchen as well. The living area “enters” the kitchen with its compositional schemes, the relationship between fullness and space, with a dynamic approach. This happens through the breaking up of the doors, above all on hanging cabinets – the system is conceived mainly for “low” hanging units, of 18 and 36 cm – but the bases are also involved in the revision of sizing. The new open compartments are also innovative, available in different colors, to be freely combined with divider elements with T, U and L forms. “Breaking down” these elements means abandoning the traditional vertical approach to the kitchen. Foodshelf thus gives rise to a new horizontal linear arrangement paced by a series of wood-effect shelves that cross the length of the kitchen, taking on different functions along the way: besides the worktop, the band positioned below the bases and those inserted on the hanging cabinets function as shelves and/or open compartments. A perfect combination of evolved functional quality and minimal but warm aesthetics, thanks to the use of wood, this original architecture is ideal for contemporary interiors, where the kitchen and living area lose their individual identities, become a continuous and multifunctional environment. The Foodshelf program includes a wide selection of furnishing proposals for the living area with solutions integrated with the kitchen or independent from it, thanks to the Fluida partition system or by combining individual storage components. The doors selected for the new collection are in decorative matte – in a range of 4 colors – and lacquer (both matte and glossy) with many colors, ideal for combinations with the wood of the horizontal bands. The same finishes and colors are also available for the storage units and open compartments. Opening is done by means of a specially designed handle or a groove in the same finish as the door, with an upper part inclined by 45° to facilitate grip. Foodshelf also includes a fine selection of original offerings, like the new open wardrobes, the Switch cabinets with vanishing doors, and the Network support for worktops. 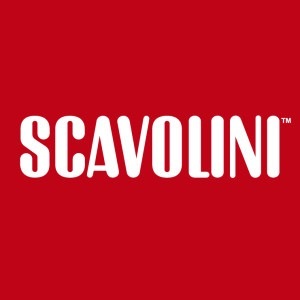 Once again, the constant research of Scavolini finds a way to get beyond the traditional boundaries of kitchen furnishings, exploring new areas of intervention, with the goal of perfecting and coordinating a truly complete, competitive range of offerings. This new program, with a cosmopolitan spirit, reflects the strategic vision of Scavolini, which in an ever-growing process of internationalization has decided in recent years to work with well-known names on the world design scene – besides Ora-ïto, Nendo, Diesel Social Team, Michael Young, Karim Rashid, King&Miranda Design and Giugiaro Design – generating innovative projects Made in Italy, surprising due to their exclusive aesthetic, functional and technological impact. 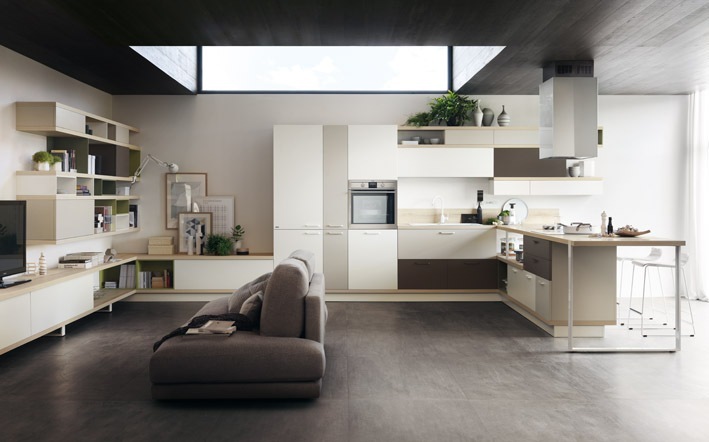 The Foodshelf program by Scavolini, designed by Ora-ïto, to coordinate the kitchen and the living area. 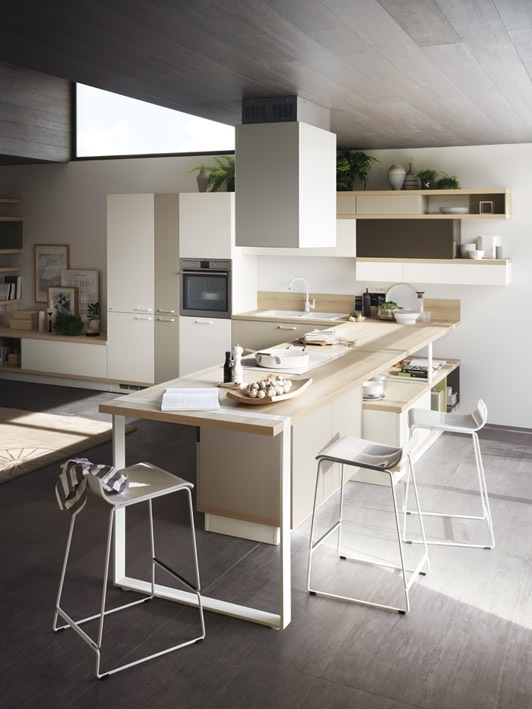 The protagonist of the kitchen zone is the central island with its clean, elegant design. 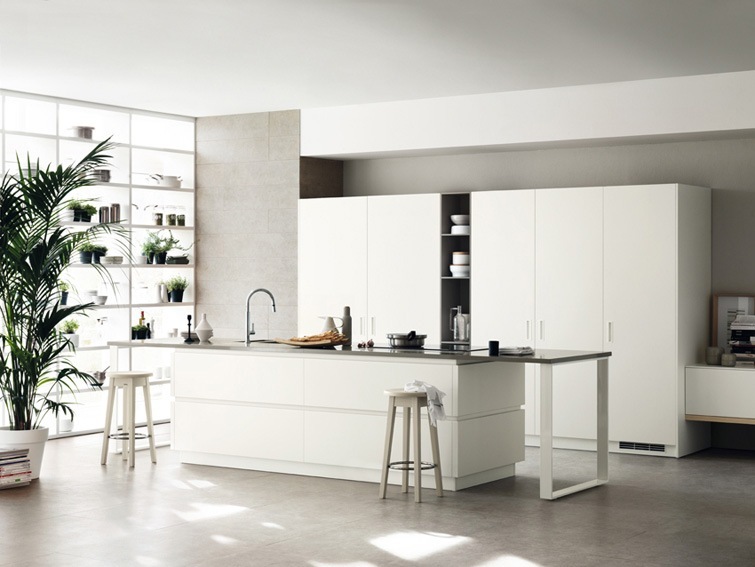 The elements of connection between the kitchen and the living zone are the hanging cabinets with doors in Bianco Prestige matte lacquer finish. The Foodshelf program by Scavolini, designed by Ora-ïto. The protagonist of the kitchen zone is the central island. Left, living solution made with the Fluida partition system, in decorative Bianco Puro. In this version the system is used as a separator to create an elegant bookcase/shelf unit for objects. 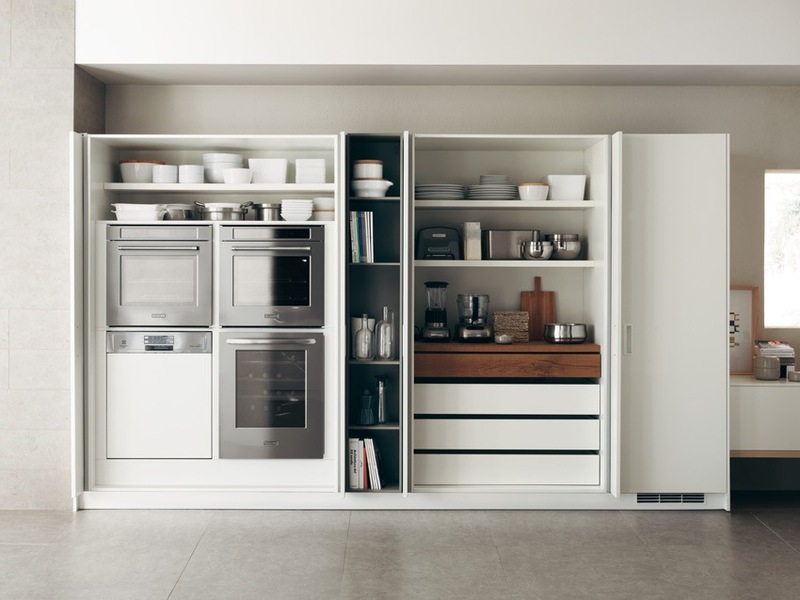 The Switch wardrobes with hideaway doors from the Foodshelf program by Scavolini, designed by Ora-ïto, a perfect synthesis of essential looks and functional quality. 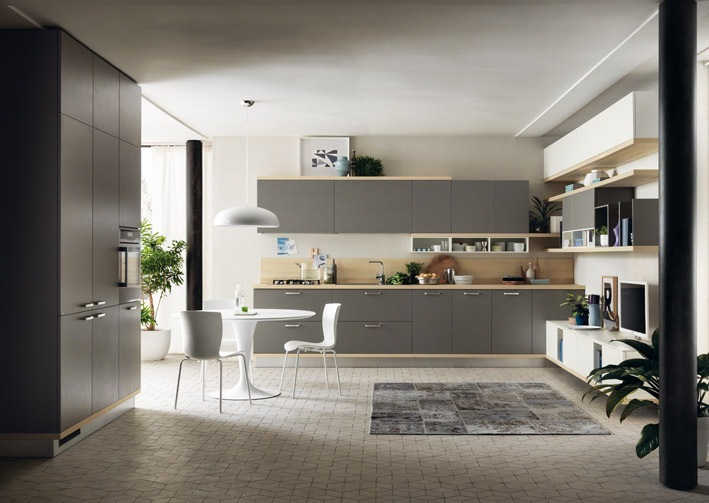 Foodshelf integrated living zone solution by Scavolini, designed by Ora-ïto, made with storage components that guarantee aesthetic coordination with the forms of the kitchen. The elements of connection between the kitchen and the living area are the suspended base cabinets with doors in Bianco Prestige matte lacquer finish. 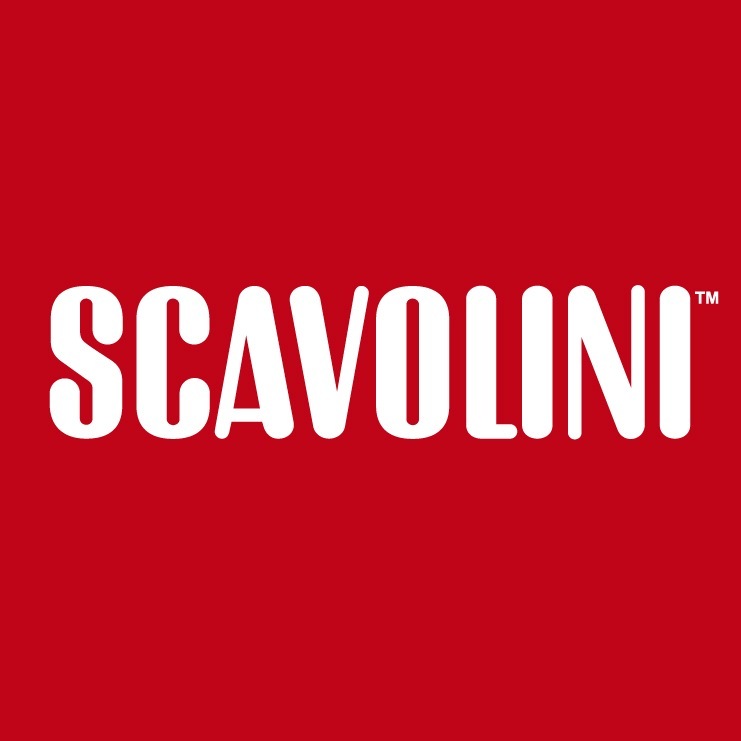 Programma Foodshelf di Scavolini, firmato da Ora-ïto, composto da cucina e living integrato. La cucina è dotata di basi con ante in laccato lucido Bianco Prestige e laccato lucido Ghiaccio, con presa a 45°. 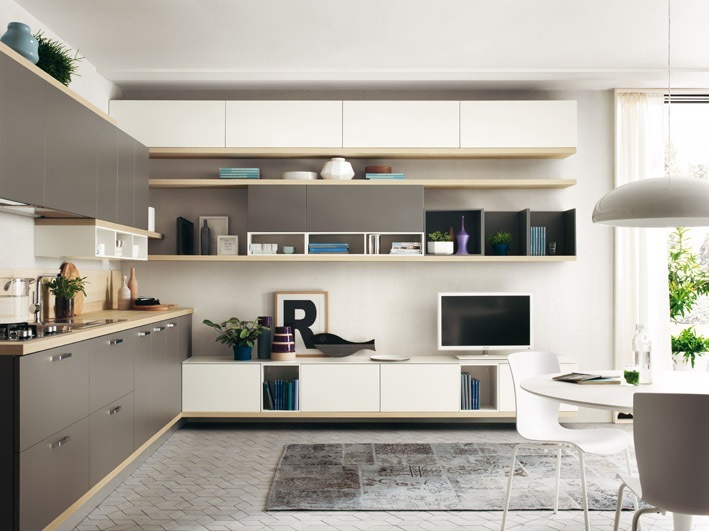 Il living integrato, realizzato con contenitori componibili, è proposto con basi sospese con ante in laccato lucido Bianco Prestige. 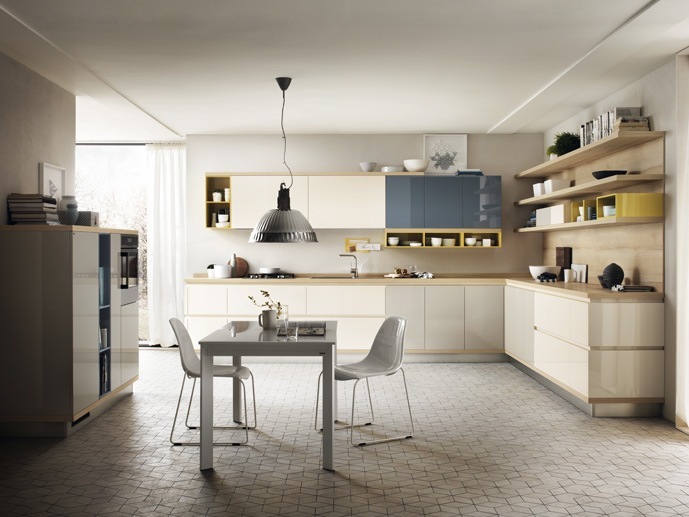 Corner composition of Foodshelf by Scavolini, designed by Ora-ïto. The versatility of the program can be seen in the extension of the groove of the basis on the exposed side, making the composition more harmonious and appealing. 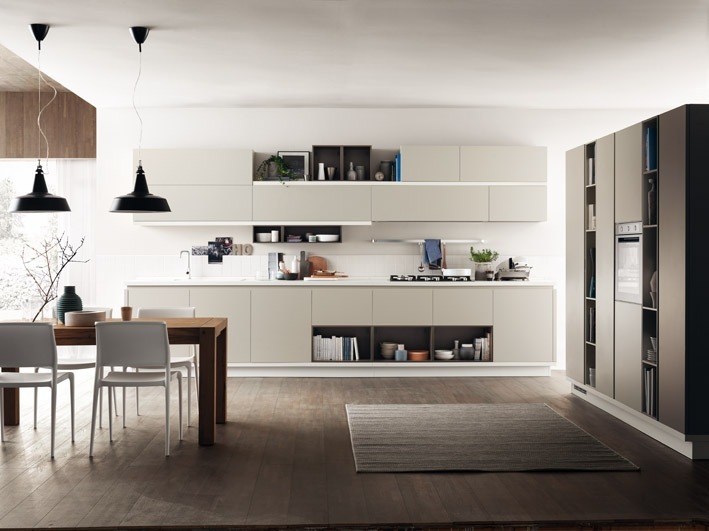 Linear composition of Foodshelf by Scavolini, designed by Ora-ïto. 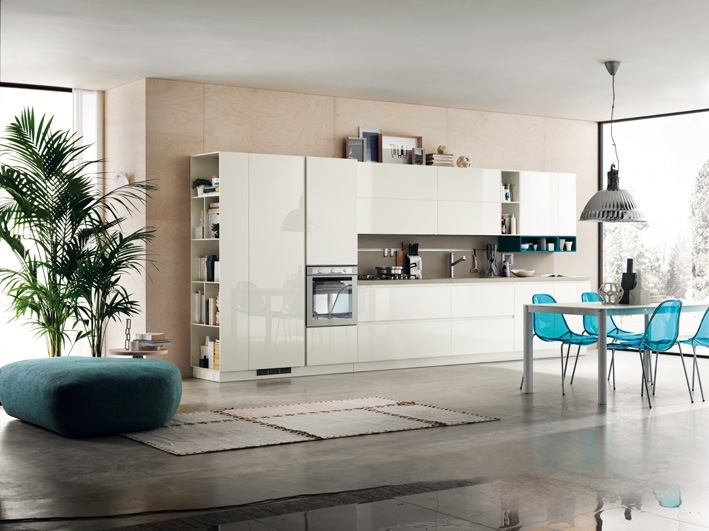 The bases – with 45° grip – and the hanging cabinets have doors in glossy Bianco Prestige lacquer. The traditional tone of the solution is emphasized by the back, top and built-in sink in patented Kerlite porcelain stoneware with the Via Tornabuoni finish. The open compartments, a unique characteristic of the kitchen, add movement to the composition. 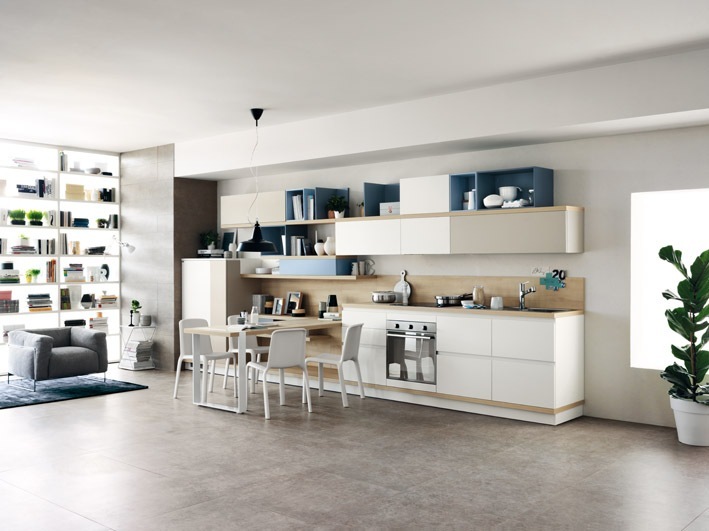 In the photo, a linear composition of Foodshelf by Scavolini, designed by Ora-ïto. The bases with doors in decorative Grigio Gabbiano with 45° grip, contain three open compartments in decorative Grigio Terra, giving the kitchen modern, trendy appeal. One special characteristic of the composition is the extension of the groove of the bases onto the visible side. 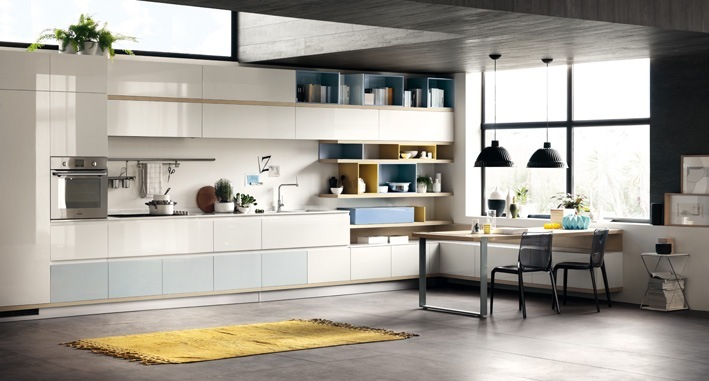 Independent living solution made with Foodshelf by Scavolini, designed by Ora-ïto, with storage components that offer absolute freedom for coordination with the kitchen. A solution with a strong contemporary character, combining aesthetic character and functional quality. 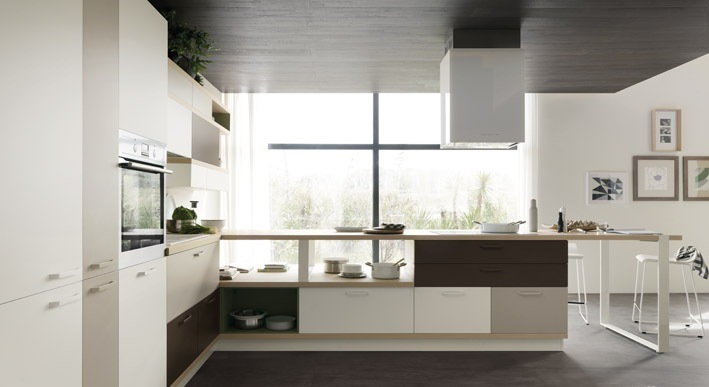 A lively linear composition of Foodshelf by Scavolini, designed by Ora-ïto. The bases have doors in decorative Grigio Terra with 45° grip. The top in Natura ash laminate – 4 cm thick – with range and sink, creates – thanks to the Holdup support – a functional peninsula, ideal to make the best use of the available space. A functional linear composition of Foodshelf by Scavolini, designed by Ora-ïto. The main characteristic of the composition is the delicate chromatic combination and the play of volumes and asymmetrical features, giving the space a fresh, dynamic allure. The characteristic graphic detail of the Network support makes the presence of the built-in table top lighter, giving the composition a personal, trend-setting style, for a kitchen that combines great looks with functional excellence. 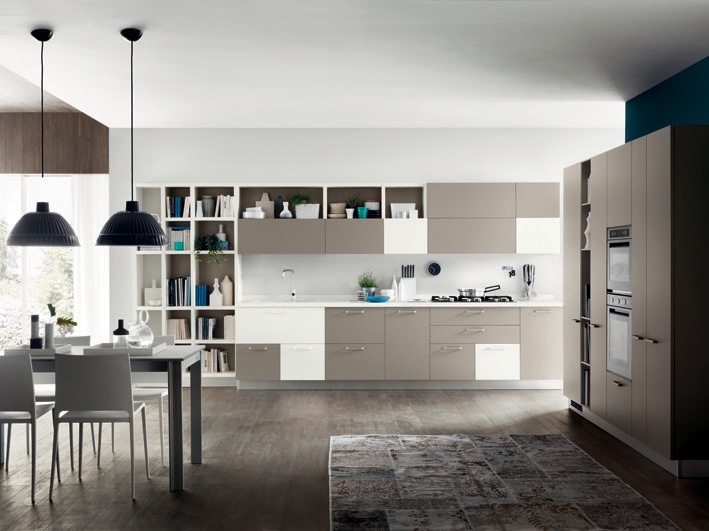 Foodshelf program by Scavolini, designed by Ora-ïto, for integration of the kitchen and the living area. The kitchen has bases in Grigio Titanio matte lacquer and metal handles with brushed nickel finish. 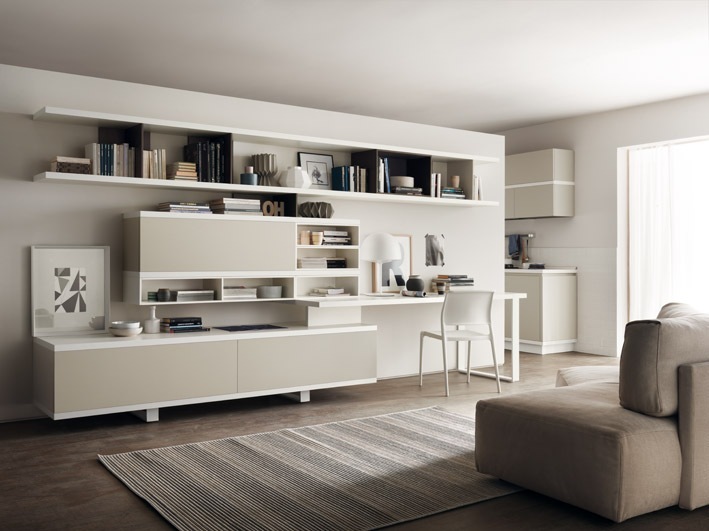 The coordinated living area, made with storage components, features suspended bases with doors in Bianco Prestige matte lacquer, alternating with open compartments in the same finish, and a top in Bianco Prestige glass. Integrated Foodshelf living solution by Scavolini, designed by Ora-ïto, made with storage components that guarantee regular compositions, coordinated to match the atmosphere and forms of the kitchen. Detail of the Foodshelf program by Scavolini, designed by Ora-ïto, composed of integrated kitchen and living room components. The protagonist of the kitchen is the large peninsula in Natura ash laminate – 4 cm thick – with the Network support to host the range. Foodshelf program by Scavolini, designed by Ora-ïto, composed of integrated kitchen and living room components. The protagonist of the kitchen is the large peninsula in Natura ash laminate – 4 cm wide – with the Network support for the range. 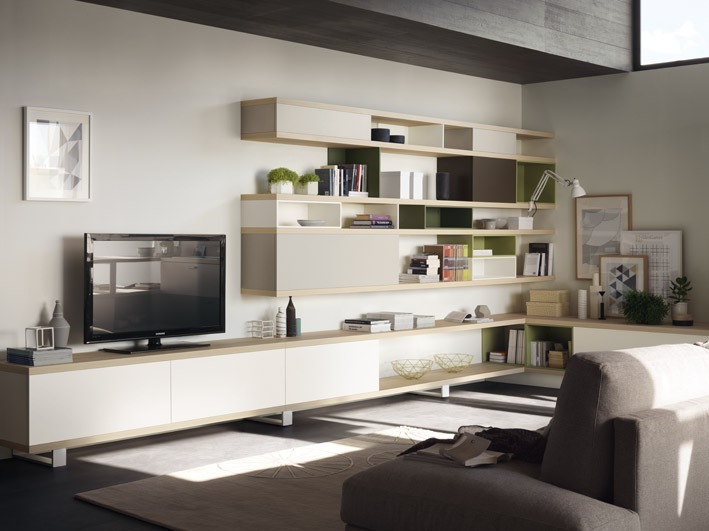 The coordinated living area, made with storage components, features bases with doors in decorative Bianco Puro and open compartments in Salvia matte lacquer, resting on the Network support. 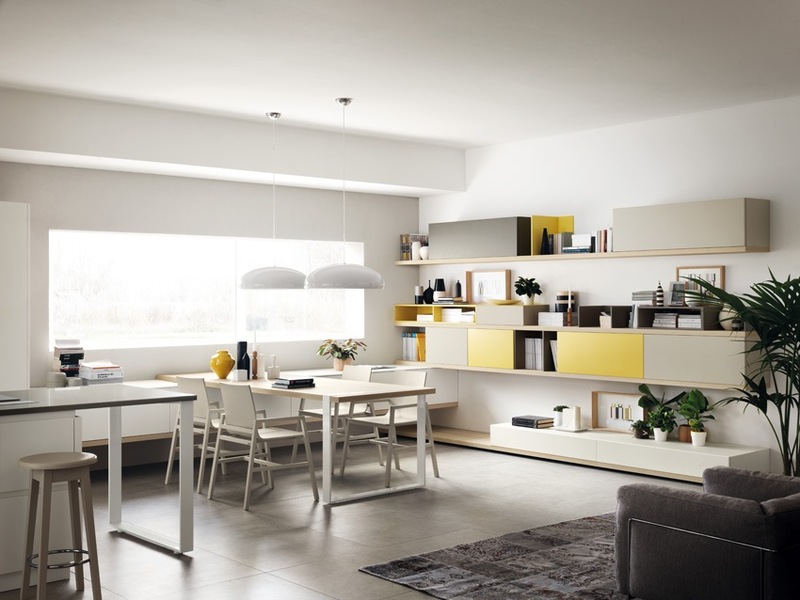 Integrated living area solution made with the Foodshelf program by Scavolini, designed by Ora-ïto, featuring storage components that guarantee coordination with the forms of the kitchen. The alternation of full and empty zones and the refined use of color grant the space create dynamism and charm.